It’s not even Thanksgiving yet but Hanukkah is only a little more than two weeks away and Christmas is little more than a month away. That means that we need to quickly think about gifts for the people we love.Some of those people are gardeners and my suggestions for the next five weeks will be books they might enjoy reading. 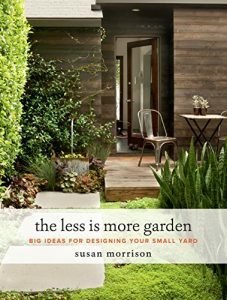 This book, written by landscape designer Susan Morrison, illuminates the fact that small gardens are more difficult to design than larger gardens. Too many different plants or concepts leave one feeling overwhelmed or muddled rather than relaxed. In this day and age, the design must be practical (relatively low maintenance) as well as beautiful. Most clients want to spend time enjoying their outdoor refuge, not working in it. 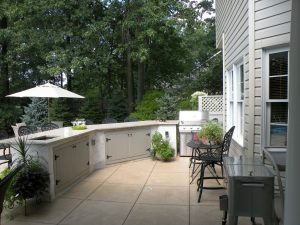 Outdoor kitchen on deck. How elaborate do you want or need? Susan believes that the key is focusing on the client’s lifestyle and how the space will be used. Therefore, she asks three questions: What will you be doing in the garden? When you will be outside? Who will be with you? Defining realistic goals is critical to preventing the inclusion of too many elements in a small space and creating a space that reflects you. It is important to focus on creating space for activities instead of objects. For instance, if you grill outside, how often? Simple or elaborate meals? Those answers will help determine the size of this space. Do you want herbs growing nearby? Is there space for a vegetable/herb garden or will herbs grown in pots, placed nearby, be sufficient? Timing is important. Are there specific times of the year when your client will be outdoors more than others? That is when you want the garden beds to look their best so select plants that will be at their best during that time. 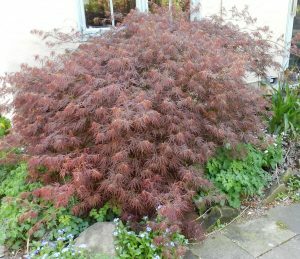 If you can choose plants that have more than one season of interest, even better. After answering these important questions, the next step is evaluating the existing landscape. Susan suggests that this evaluation should be in the following order: primary living spaces, structures, pathways, plants, and accessories. This takes discipline because many people tend to look at plants first, not last or almost last. During this evaluation, they should be thinking about scale and proportion, circulation patterns, and comfort. Small patio designed on the diagonal. I loved Susan’s examples of both curvilinear and rectilinear design on paper and then photographs that showed the reality of each. They are inspirational and easy to understand and apply. Susan also reminds us that diagonal designs are particularly effective in countering the bowling alley effect of narrow spaces. She has many practical suggestions, e.g. a firepit rim that can be used for plates and glasses; including attractive outdoor storage for seating cushions, toys, tools, etc. with storage chests that can also be used as seating; using vertical space (walls and fences) and illusion (mirrors) to increase perceived space. 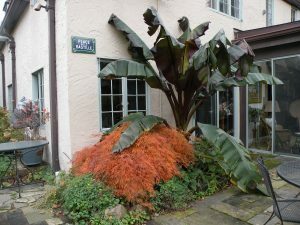 Although many of the plants are applicable to California, Susan’s design philosophy and ideas are universal. 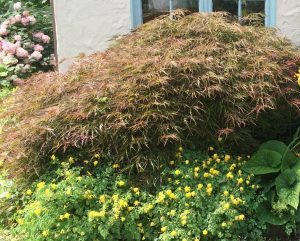 Susan is a kindred soul and I think that her book would be a great companion to my book, Garden Renovation: Transform Your Yard into the Garden of Your Dreams. 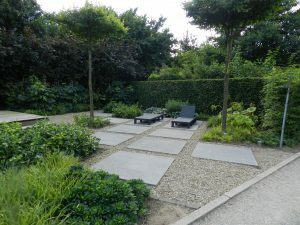 Although The Less Is More Garden was also written with the homeowner in mind, it is equally useful for landscape designers because it reiterates many ideas about which we should be thinking and incorporating in our designs. This will be a highly useful book for anyone thinking about making changes in their landscapes.